Because we were so comfortable with our site at Lewis and Clark State Park, we took our time on Wednesday morning. 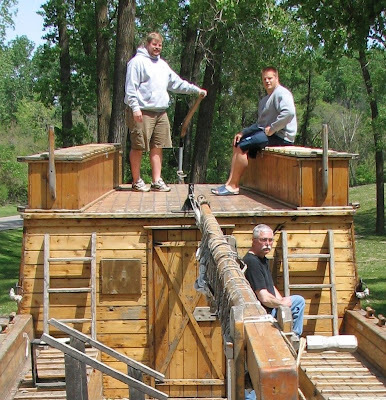 The park has an interesting keelboat display that we climbed around on for awhile. We got back on the road around noon. 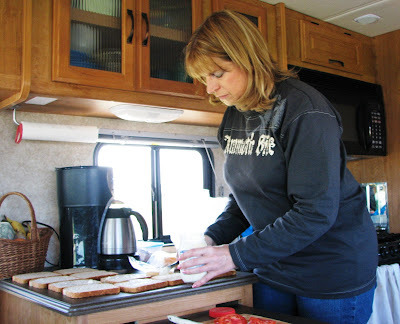 We found that it works best to have plenty of sandwich materials and fruit around for traveling days so that we can snack as we go rather than stopping for big meals. I’ve gotten pretty good at making my way around the kitchen while we are moving down the interstate. We decided to stop in the Amana Colonies for the night. 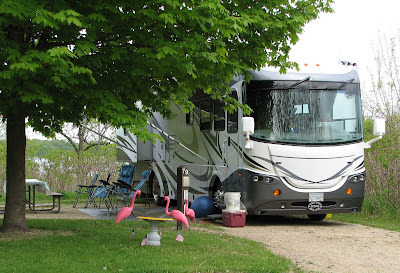 The Amana Colonies RV Park is a Passport America member so once again we were able to get full hookups for $14. The park itself is not much more than a field with gravel sites and hookups but it fit our needs. 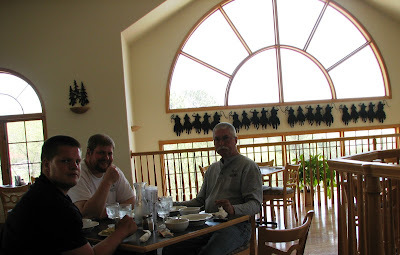 After we set up we decides to go in to Amana to try out on of the Amish family style restaurants, the Ox Yoke Inn. I sampled both the local rhubarb and the dandelion wine. The food was good but didn’t seem to be anything special. Perhaps that’s because German family-style cooking is not something out of the ordinary to us. Besides, Ken had not been feeling all that well since mid-afternoon so, after a short drive around Amana, we headed back to Baby. Unfortunately during the night, Ken got really sick. . It was pretty obvious he was dealing with a blockage. I was very concerned that I might have to drive him in to Iowa City. He took a dose of prednisone about midnight. It didn’t seem to do the trick to he took another dose between 2 and 3 a.m. Having had Crohn’s for over 30 years now, he can read his condition pretty well, and having lived with him with it for 27 years, I can read pretty well how he’s doing. At about 4am he seemed to be able to start resting a bit more comfortably and finally from about 5 – 7 am was able to actually sleep. Of course, I’m not able to sleep then! I had worked out in my head that we were quite a bit closer to home at this point than if we continued on to DeKalb. Because of all Trevor’s visits to Iowa for football recruiting I was quite familiar with the roads between Iowa City and Quincy so when Ken woke up again I recommended we divert and head to Quincy instead of DeKalb. He suggested that instead I take the boys back in to Amana for a big breakfast and some sightseeing which would allow him a few more hours sleep. We’d make our decision after that. Kyle, Trevor and I went to the Brick Haus restaurant for breakfast. It was basically a family style, all you can eat breakfast served at your table, with juice, sausage, bacon, eggs, potatoes, fruit, and some really great pancakes. We obviously took our time there! After breakfast we visited the local microbrewery, Millstream Brewing Company. They were bottling that day using an old 1957 Coca Cola bottling machine that they have refurbished for the job. 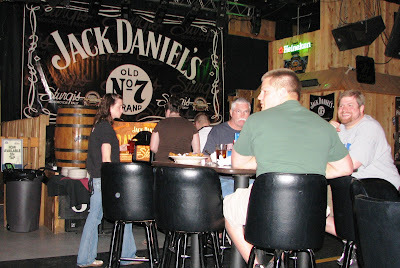 We sampled a few beers and to buy a growler of their Schild Brau Amber. What turned out to be the family favorite was the Old Time Cream Soda they make. They use beet juice for sweetening instead of high-fructose corn syrup. We only bought a six-pack but if I’m through there again it will probably be a few cases. We also found an appropriate little button there for Dad that says, ‘You can Tell a German, But you Can’t Tell him Much!’. Another stop in Amana was the butcher shop and smokehouse. The RV park gives you a token to get a pound of brats there for a dollar. In addition we picked up some great summer sausages, and a jar of horseradish. Our last stop on the way back was the convenience store to get Ken some seven up and gatoraid to help him get his hydration built back up. I have to say, Amana was not what I expected. In our part of the country, there are several Amish Mennonite communities, and in my travels in Ohio and Pennsylvania I’ve been through several such communities. In my past travels the stores and restaurants were obviously owned and operated by the Amish and the people, homes, and transport in the area were clearly Amish as well. When we’d travel to Charleston, IL, we’d frequently stop in Sullivan where there are hitching posts along the streets for the Amish shoppers and a nice Amish-owned restaurant in the center of town. In comparison, Amana, to me, was a bunch of old buildings and stores set up for tourist trade. I didn’t see a single person dressed in traditional Amish attire, no horse ‘n buggies, and Kyle was the only man I even saw sporting a beard. I guess what I’m saying is that Amana felt much less like a genuine Amish community than places like Colony, Mo. 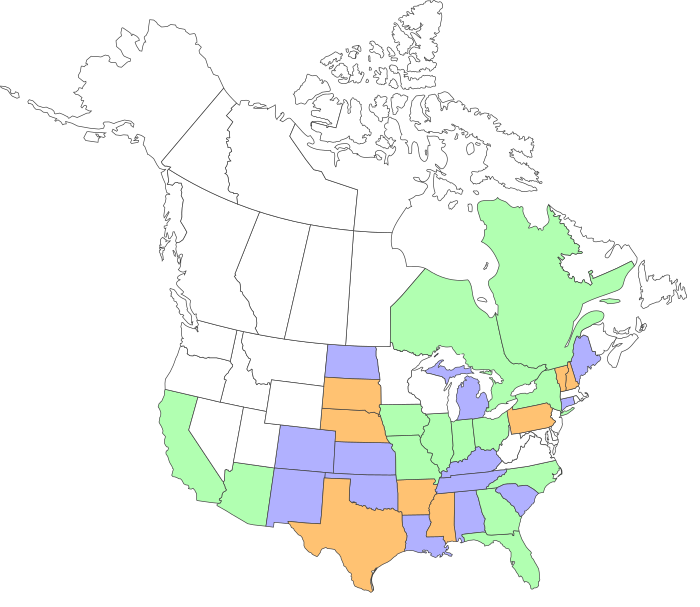 (Mennonite I believe) which no one talks about visiting. Besides Ken being sick, the other downside to this section of the trip was that I forgot to take the camera into town, so we didn’t have any pictures. When the boys and I got back to the RV we were surprised to see Ken outside packing up sewer hoses in preparation for leaving. He still wasn’t sure if the blockage was cleared and wasn’t going to risk eating anything but really wanted to continue on to DeKalb if the boys could finish the jeep hookup and I was game for doing the driving. 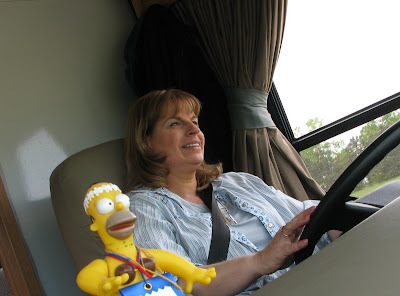 Ok, so maybe Homer doesn’t look so comfortable with me behind the wheel but we made out fine! 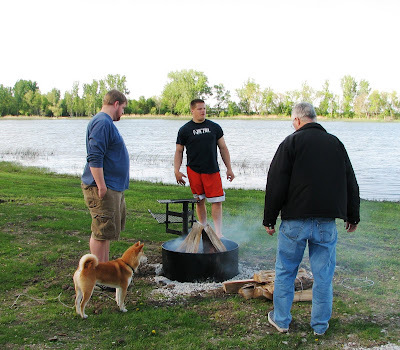 When we arrived at Shabbona State Park our destination for the final 4 nights of our trip, it was obvious that Memorial Day weekend was starting to gear up. Although only Thursday afternoon, the office phone wouldn’t stop ringing with people checking site availability. The park was totally full already including all non-reservable sites. Thankfully because we had a site reserved for Friday, Saturday and Sunday, that sight was already available for us. Ken was feeling much better and was able to expertly back us into the perfect position on site 79 on the very first try. The boys headed in to town to work out. The plan is that they will sleep and Kyle's place the through the weekend so suddenly the RV feels a lot bigger! A New One Day Distance Record: 495 miles! Listening to the weatherman Monday night it sounded like we had planned well. Tuesday would be one of the very few days with very little wind. We got up and on the road early, Tuesday. Everyone was in the routine now and so with the driving easy without wind, we were averaging 60 mph, only stopping when Ken needed a bio-break a couple of times. 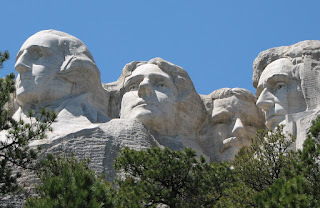 Ken and I had talked about wanting to stop at Lewis and Clark State Park someday along the southern edge of Iowa and so as we neared Sioux Falls we decided to head south and make that park our destination. We pulled in to the state park late afternoon, having logged 495 miles in a little over 8 hours, a new one day mileage record for Ken and Baby!! We were very pleased with what we found. Level, shaded sites, right on the water. This park seems to be getting ongoing facelifts with this lodge in its last phases of construction. It already looks almost like a postcard! The guys started a fire and decided the site’s brand new firepit/grates would work well for cooking over the open fire. After supper, the boys did their workouts. I have been really impressed with how committed these guys have been to maintaining daily workouts while on the trip. They get creative on their workouts based on the terrain around them and space they have to work with. 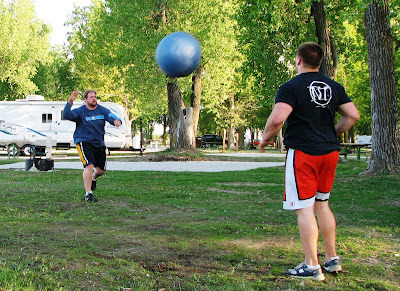 Ken got this picture of them doing their version of a ‘medicine ball’ workout. They took my exercise ball, removed the air and instead filled it with water. It took all I could do just to lift the thing off the ground but they did variations of throwing it as part of their strength routine. Another part of this park the guys really enjoyed, was having nice clean, hot showers after their workout without having to take turn's in Baby's rather confined shower space. We ended the evening sitting around the fire under with a full moon rising over the waters. Ken and I are sure this is a park where we'd like to spend many days if we had the time and so now it will be on our 'Future Destinations List' for a return trip. We’ve decided since we like this park so much we’ll sleep in tomorrow and make it a short travel day just as far as the Amana Colonies. 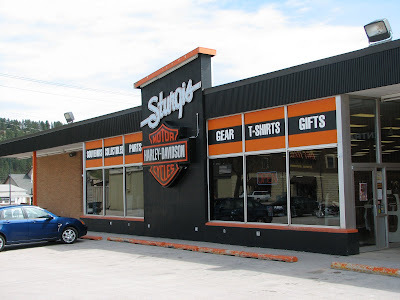 Of course, the one thing Sturgis is none for beyond anything else is the annual motorcycle rally in August, during which time this small little South Dakota town grows temporarily to the largest city in South Dakota. It seems that most of the commerce around this area is devoted to those 10 days of the year. Many of the stores and restaurants are not currently open. 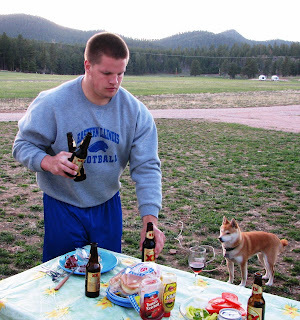 There are dozens of campgrounds that are nothing more than empty fields with electric hookups. Almost every campground we checked in to within a 100 mile radius had special notes about ‘bike week’ such as ‘no discounts during bike week’ or ‘by reservation only during bike week’. That would be a very different world to experience – just once! This was the stop where Trevor wanted a souvenir so our first stop was the Sturgis Harley Davidson Store so he could get a T-shirt. 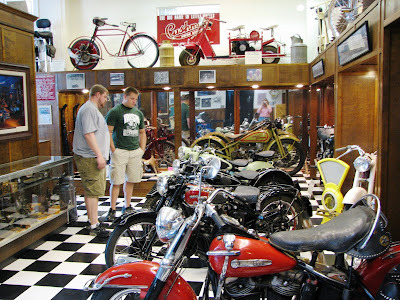 After that we toured the Sturgis Motorcycle Museum. The guys really enjoyed this. There was also a video shown of the history of the motorcycle rally which we started to watch and ended up all four of us got so caught up in it we sat though the full 45 minutes. 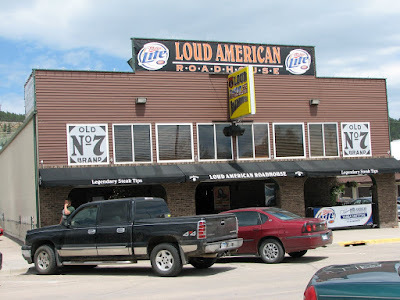 It was lunchtime, so we stopped at a local landmark, the Load American Roadhouse. 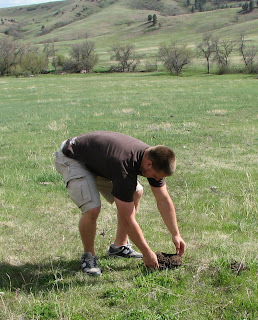 Our afternoon stop was at Tatanka: Story of the Bison. This place is owned by Kevin Kostner and is just north of Deadwood. He had hoped to someday build a resort here but without backing from any other investors, decided to turn the area in to a tribute to the bison and the Lakota Indians of the area. 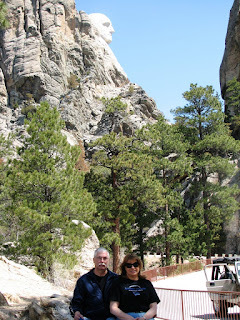 What really made this visit special to me was our Lakota tour guide, who provided a lot of great insights into the Lakota way of life, especially the tight day-to-day connection to the bison. Interestingly, some of the information she provided, like why we should never use the word ‘squaw’, were also mentioned in the novel I’m currently reading. I had picked up the book “Ride a Painted Pony” by Kathleen Eagle at our library before the trip. It’s set on a South Dakota Indian reservation in modern times so it turned out to be an especially enjoyable read for this trip. I think you have to be in the right frame of mind for Tatanka to take your time and enjoy what there is here to learn. For example, the Lakota people treated their women very equitably and, in fact, the tepee and it’s contents were all considered the property of the woman. They are known to have over 100 uses for the varied parts of the bison the hunted. I found the clothing and its detailed particularly beautiful with great thought to functionality. 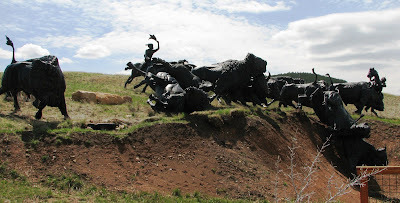 The centerpiece of this site is a huge bronze sculpture that Kostner commissioned which depicts a ‘buffalo jump’. 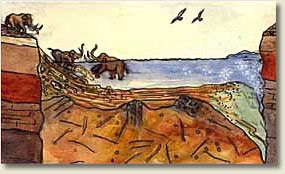 This was the common method used by Native Americans to hunt these huge creatures, essentially causing a stampede directed toward a cliff so that some of the animals would be killed in the fall. We picked up some pork chops on the way back to the RV. The guys worked out, while I tried to get caught up on emails and then took the dogs for a walk along one of the trails at the RV park. While the people at this RV park are very nice and facilities are fine, I was very sorry to see that they had been very sloppy in maintaining the nature under their care. There were several spots where they had dumped things such as trashed washers and dryers, old cars, and the like. I cut my walk short when I encountered that. Tomorrow, it’s time to start heading back east! 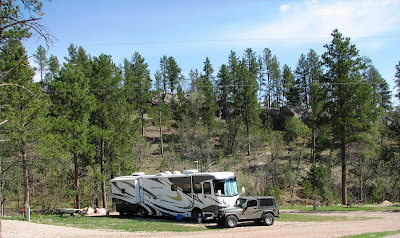 Sunday morning we took our time packing up to move north to the Deadwood/Sturgis area. This included packing up Trevor’s comfortable separate bedroom in the tent behind the motorhome. Do you call it ‘roughing it’ when you got electric, DVD’s, MP3’s and laptops with wireless access in your tent? 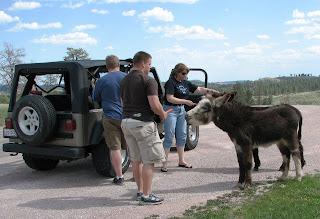 The trip was very comfortable and scenic between Hill City and Sturgis. We had picked a sunny day with no wind, thank goodness. 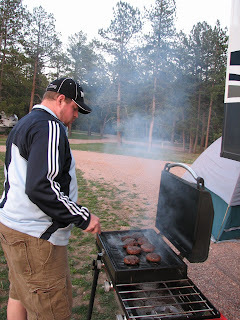 We had chosen the Rush N More RV Park for two reasons. 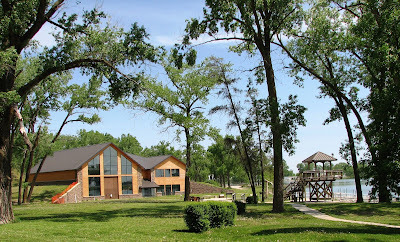 It is a Passport America park so we got ½ price rates and it was recommended both on RV.net and campgroundreviews.com. 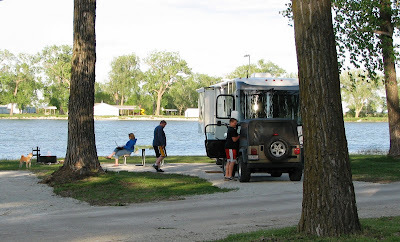 One of the guys who stays there for the summer in his motorhome and has a gorgeous big Honda trike gave Ken a tour of the campground to pick out a site. We chose a new section they had set up in the wooded area some distance behind the main park where we had to share the area and the scenery with only two other RV’s. 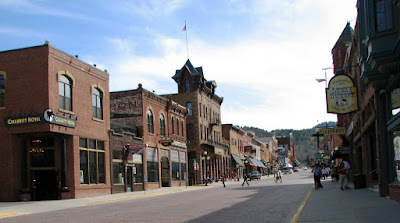 After setting up camp, we decided to drive in to Deadwood for some sightseeing. One of our primary stops was the ‘Saloon No. 10’ where Wild Bill Hickok was killed. 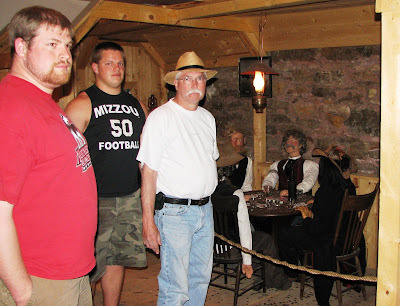 In the lower level of the saloon they have a lot of interesting information on that interesting time in the wild west along with detailed descriptions of Wild Bill’s life, the day he died, and the multiple trials it took to convict his murderer. 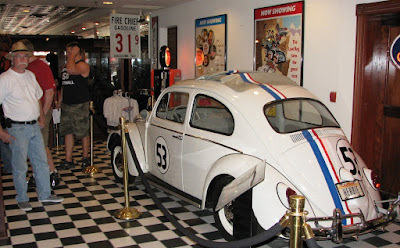 Another interesting stop was the Celebrity Hotel where they have lots of memorabilia from movies, like Herbie, The Love Bug.. 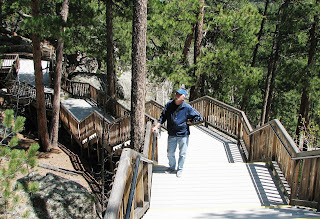 The guys had to be able to say the gambled in deadwood so we did stop very briefly at some of the slots. 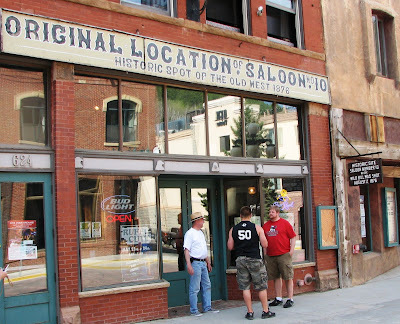 Gambling is, by far, the big tourist attraction in Deadwood, although not at all a big attraction to any of us. However, like most big gambling sites, they did have their fair share of low-cost buffets, so we stopped at the Silverado for their prime rib buffet before heading back to the RV. Tomorrow we’ll head in to Sturgis. 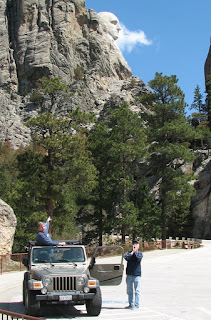 Saturday we drove south through the Black Hills to visit the Mammoth Site in Hot Springs, South Dakota. 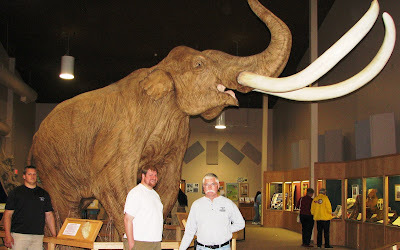 This is the largest ‘in situ’ (bones left as unearthed) Mammoth site in the world. I had my doubts about taking the 30 mile track down south to see this but are very glad that we did. This is a working archeological site. 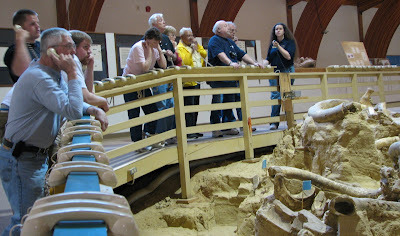 Of course, with us visiting on Saturday, there were no archeologists actually in the dig that day. 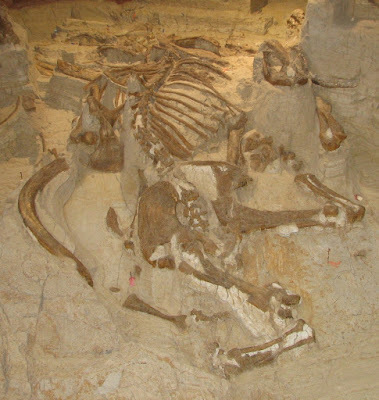 However, they do an excellent job with a very educational tour describing how this particularly large collection of prehistoric animal bones ended up in such a confined space which was basically a 90 foot wide sinkhole 10’s of thousands of years ago. 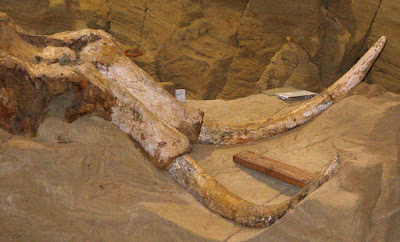 Almost all of the mammoths uncovered here have been determined to be male. Our guide joked that there were plenty of theories on why the male of the species were the one’s who ended up falling into the sinkhole. The also found this huge prehistoric version of a bear in the hole. Since an animal with foot long claws like this should have been able to climb out of the hole, they theorize it may have gone in after a stuck mammoth that gave more of a fight than expected. 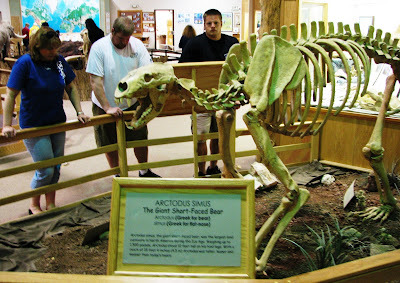 While this site’s goal is to uncover the bones but leave them where found, they create replicas like this one to show the size of the animals that have been found in the site. They also have this replica of a bone hut which was a type of lodging assembled by the people living during this save period, intricately interweaving the bones of the large animals they hunted for food and hides. Joel’s Dakota Grill, right next door to the Mammoth Site, was our stop for lunch. After lunch we drove back north to Wind Cave. I was really interested in this cave because it is the place according to Lakota Indian legend where man and buffalo ascended onto the earth. In fact, we were later told by the guide at Tatonka that it is consider a sacred place by ‘the people’ who do not go down in to the cave for that reason. We arrived in time for the 2:30pm tour which takes about 75 minutes. 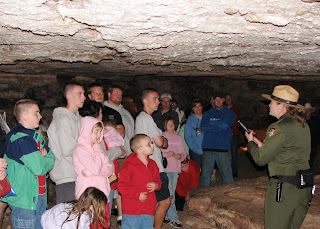 A park ranger guides the tour providing a lot of details about the history of the cave which is currently the third longest in the world. I say currently because they regularly add to its length since there are still so many unexplored sections. 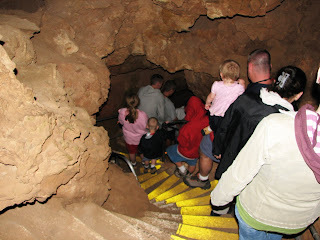 The natural entrance to the cave is only big enough for a small human to slide in to. If you see the small pine cone to the right in the picture below you get a sense of how small. 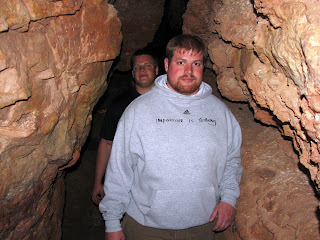 My guys would not have to worry about exploring this cave if that was the only way in! 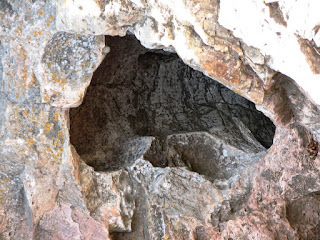 It is this entry where the cave got its name since since whenever there is a significant change in barometric pressure the wind whistles in or out of this entrance making a noise that can be heard for quite a distance. This cave takes you down more than 20 stories deep in to the earth. This was Trevor’s first cave experience and he discovered early on in the tour that he is much more claustrophobic than he realized. There are a lot of tight spaces to walk through that these big had to squeeze through. Trevor’s opinion was pretty clear with the steady tirade of spelunking being the stupidest sport ever conceived. Trevor obviously gets this from his father’s side of the family since Ken had opted to stay in the jeep and take a nap while we did the tour! Having done several cave tours over the year, I wasn’t particularly impressed with this cave myself. As a biology major, Kyle had several caving adventures below and had a similar opinion to mine that the cave was ok but certainly not a highlight of our trip. 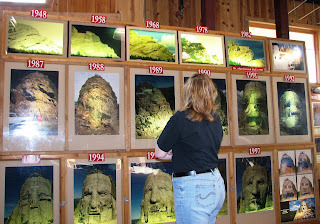 However, it does provide a glimpse to a very unique stone formation shown here known as ‘boxworks’. 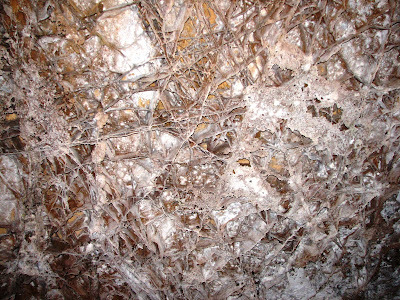 This cave has more of this rare formation that anywhere in the world. You can see how it got its name, looking almost like corrugated box dividers. Thank goodness, after a final wrapup at the lowest point in the tour, we were able to take an elevator back up to the surface. while the boys worked out, showered, and then made dinner for us. The Alpine Inn has nothing on the Frericks brothers grilling a few local choice ribeyes on the grill. After another full day of enjoying the Black Hills, Ken and I retreated to our bedroom early while the guys watched a movie. 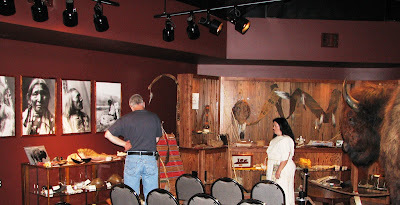 Tomorrow we will be packing up camp to move north to Sturgis and Deadwood. Note: in answer to recent comment. Kyle will graduate next Saturday, May 24th. He gets one week off after that, then an intensive 8 week course of study for the bar exam. That exam is July 29-30 in Chicago. He then intends to come back to Quincy to look for work. He feels strongly even if the legal job market is very bad he would rather find something in Quincy as his longterm dream is to settle back in his hometown. 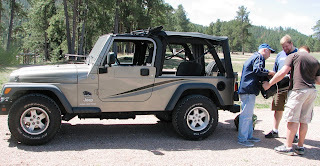 We woke to a beautiful day, Friday, so the guys decided to take the windows out of the jeep before we started exploring the Black Hills. Rafter J is not small from Mt. 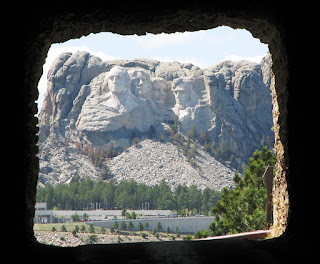 Rushmore and it wasn’t long before the guys spied George Washington! 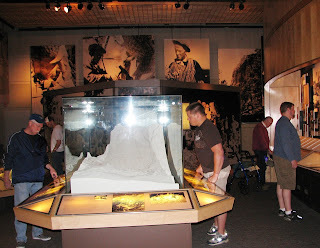 We all really enjoyed all the information inside Mt.Rushmore National Monument explaining how it was designed and built. 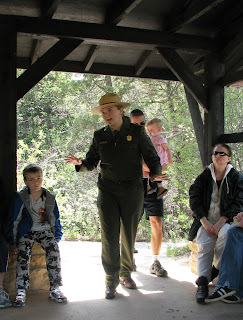 There are movies on both the building of the monument as well as a good movie about the wildlife in the area. 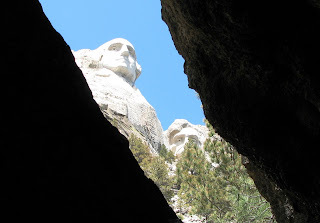 The best views of the monument are along the Presidential Trail. 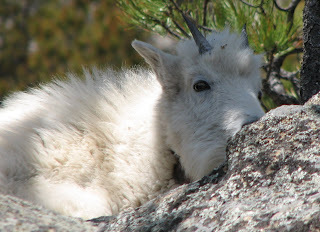 While Momma grazed nearby . 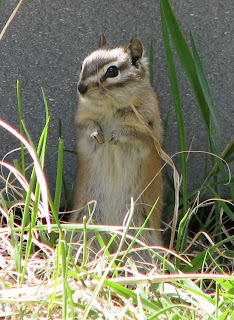 There were also lots of chipmunks particularly in the snack shop area. They appear to have a bit of an ice cream addiction! 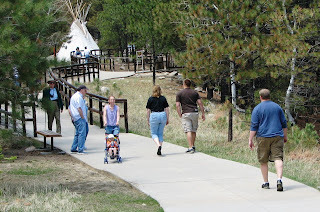 From Rushmore, we headed toward Custer State Park. 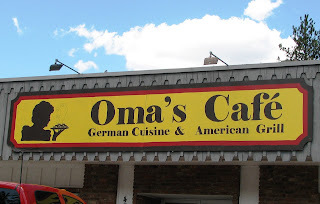 Along the way, we passed through Keystone where we found this great German restaurant for lunch. We had various sausages, along with homemade chicken spaetzle soup, kraut, rutkohl and fresh horseradish. I believe the boys’ Oma’s would have really enjoyed it! 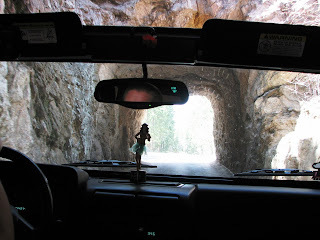 One of the things you want to be sure to do in driving through Custer State Park is to stop after the many tunnels and look back. 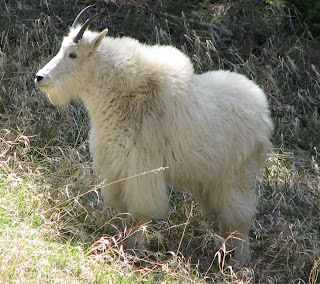 Custer State Park is home to an amazing variety of wildlife. 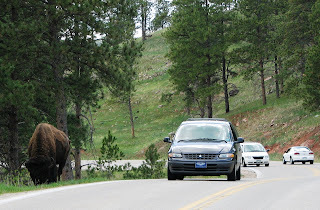 The bison don’t seem to have much fear of the highway. We were amazed watching a few young one’s playing on the plains to see just how fast they could run, which we heard later was up to 35mph. 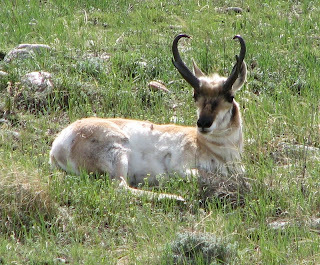 The antelope were probably the animals we saw most frequently. 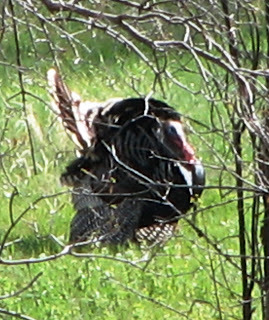 This handsome jake turkey had several hens in his entourage. And Joe G. if you are reading his from your base in Germany, please note that Trevor was intent on getting you a fresh new buffalo chip to replace the one that’s been getting mailed around the family. We reminded him, however, than Uncle Alan said it’s a problem mailing these to an overseas army base since they will ask you what is inside and they don’t take kindly to you telling them you are mailing a box of sh$t! 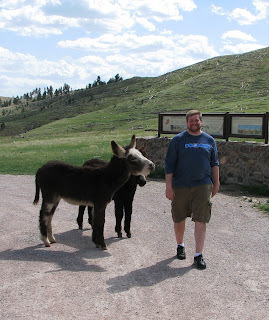 My favorite animals in the park were by far the wild burros. I had read on some forums about the possibility of seeing them and how much they loved carrots, so I had brought a snack for them just in case. 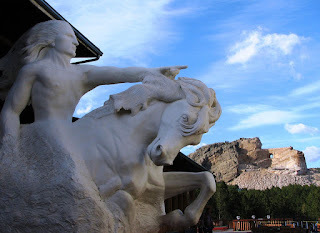 As we mentioned, Rafter J is really nicely located for doing Black Hills touring and so we were able to take in the Crazy Horse monument on the way back to camp. 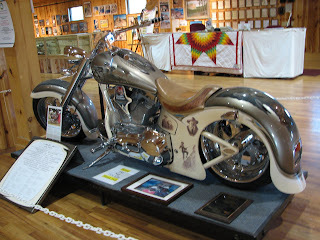 Crazy Horse is the ultimate in a family dream. 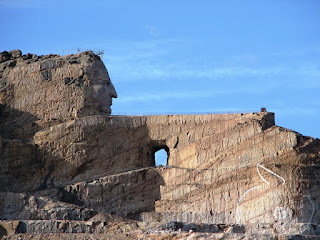 Sculptor Korczak Ziolkowski and Lakota Chief Henry Standing Bear officially started Crazy Horse Memorial in 1948. The Memorial's mission is to honor the culture, tradition and living heritage of North American Indians. Although Korczak died, in 1982, he had imparts to his wife and 10 children, “not only the necessary knowledge and skill, but also a deep love of the Crazy Horse dream”. This dream is totally privately funded through donations. The Ziolkowski refuses any government funding, wanting to keep out any interference that might cause this world’s largest sculpture from in any way deviating from Korczak and Standing Bear’s original vision. We spent quite a bit of time touring the visitor’s center where this is a detailed pictorial history from 1948 to present on the monument progress. 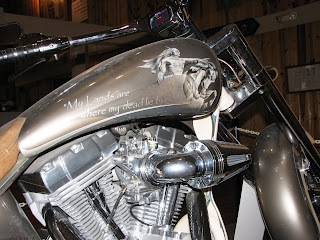 The guys were drawn to this special motorcycle designed specifically in honor of the monument and donated to the cause. A raffle was held that brought in 200K+. The couple that won the bike leave it on display at the center. We talked about the boys coming back here someday with our grandchildren wondering what it would look like by then. It feels sort of like you’ve visited something like the pyramids, midway through their construction! On the way back to camp, we dropped by the local market and bought some buffalo burger, which Kyle grilled to perfection! Did you know that per oz. buffalo has less fat and calories than beef, pork or chicken? Trevor contributed the table settings including keeping a cold Dos Equis in front of Dad and the cook. Wow! What a great day of adventure! I could spend a month here, no problem!